Final update added at 6 p.m. Affable and entertaining, Jim McElwain was introduced Saturday as the 24th head football coach in the history of the Florida Gators. McElwain came right out of the gate and detailed his high level of appreciation for the opportunity to coach Florida, calling the Gators job something special and one of very few at the highest level in college football. 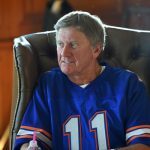 He went on to discuss some of his philosophies, his upcoming agenda and how he plans to move forward over the next month, all of which has been captured and broken down here on OnlyGators.com. I got to tell you something now: what an honor, how humbling it is to be a part of one of the greatest brands in all of college athletics, to have the opportunity to be a part of something that’s real special. You look out and you see that stadium, you think about all the great players, people, traditions that have been built at the University of Florida. That’s something that is so exciting. I grew up in Montana. These are things you dream about. Yet along the way we’ve had the opportunity to learn a lot of great things, meet a lot of great people, learn life lessons that help you be successful. That’s kind of the goal here, not only in the athletic department, but when you look at the quality that is the University of Florida, that brand, what it brings with it. I can’t tell you how excited myself, my wife, my kids are. They’ve been through a lot now, all right? For us to be a part of Gator Nation is something that means so much. “As we kind of build this moving forward, I talk about this for the people who are involved in what we do and how we do it. What I would ask? Let’s go affect the people around us in a positive way. Let’s be part of something special. Let’s keep pushing it to the next step. That’s really what it’s all about. As we create the process, as we create the infrastructure, as we put the pieces in place that gives you success, those foundations and fundamentals that all people have, let’s not forget one thing: it’s about these players. “I want to say this. Coach [Will] Muschamp has been very helpful. You talk about a great guy, a great ball coach. He’s put together a heck of a staff here that’s going to go forward as I’ve talked to them about going and winning a bowl game. That’s what it’s all about right now. It’s about investing in these young men who are here. Our jobs as educators, our jobs as coaches, are to be involved in young men’s lives to help them as they move on down the road. One of the things that it’s going to be, being part of the Gator family, being part of this organization, is going to do nothing more than better you for the rest of your life. That’s really what it’s all about. McElwain was non-committal overall about his plans for Florida’s coaching staff, noting that he is still a ways away from evaluating the Gators’ current coaches and piecing together his collection of assistants. “These guys have come here and done a great job for this university. We haven’t made any plans moving forward right now as to anything as far as that goes,” he said. 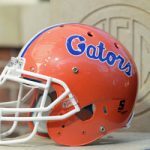 McElwain met with Florida’s coaches late Friday, holding an extended meeting in the football offices to discuss the Gators’ recruiting board and needs going forward. He plans to hit the ground running on Monday and believes he will learn a lot about the coaching staff by watching them recruit. 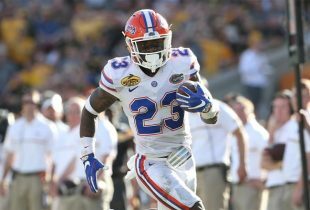 Ahead are meetings with the entire Florida staff, including more sit-down sessions with the coaching staff on Saturday and Sunday before they all hit the road recruiting. From the way McElwain spoke about the Gators’ staff during an interview on SEC Network it sounds as if he is seriously considering a good portion of them, if they are interested in staying. “This coaching staff has done an outstanding job here. What we’re going to do is evaluate everybody – everybody – in the whole organization, whether it’s coaches all the way through. Their opportunity is to go finish the season right for this Gator team and step us forward,” he said. As far as his plans for the coaching staff as a whole and when he expects to have one in place? “Get the best that’s a fit for the university, get the best that’s a fit for the area. We’ll do that very diligently. I’m not sure there is a timeline,” he said. There is no questioning that McElwain understands the importance of recruiting. In fact, he spoke more about recruiting on Saturday than he did the current Florida team or his coaching philosophies. “We’ll hit the road next week, get to as many places as humanly possible from the recruiting standpoint because it’s one of those things. It’s recruit daily or die right now,” he said early in his press conference. McElwain has experience recruiting the state of Florida from when he was at Louisville, Michigan State and Alabama. He said one of the things he is most excited about is “rekindling the relationships” he had with high school coaches throughout the state. The plan right now is for McElwain to stay out on the road from Monday afternoon through the start of the dead period (about 10 days away, lasting for a month). While out on the road, this is the pitch he plans to give to the players he meets. “You’re going to get an opportunity to play, number one, in the best conference in America, number two, against the best people in America. But more than that, you’re going to get an opportunity to grow as a person. You’re going to be able to be better for the rest of your life because of the experience you’re going to have at the University of Florida. This runs a lot deeper than just those four years,” he said during his SEC Network interview. McElwain has a long way to go in terms of determining how he would like Florida’s roster to shake out. The good news is he’s already gotten started, but it will take him a while to come to legitimate conclusions. “This is one of those deals that first needs to be evaluated. You don’t make snap judgments, right? What you got to do is you have to sit back, reflect, learn, take in, then make the process move forward,” he said. A meeting between McElwain and the Gators will come on Monday. While there, he will tell Florida’s players to “embrace what they’re doing” and “go win a bowl game,” but he will also deliver a message about moving forward under new leadership. “Each one of our lives, anytime anything’s different, there’s a sense of, ‘Oh, what’s next?’ One of the [most important] things is just about building the relationship, building the trust. These guys are going to know I’m not one of these guys that’s going to come in and say, ‘You’re someone else.’ That isn’t how it works. You’re a Gator. I’m a Gator. Give me an opportunity to be part of your life and impact it in a positive way,” he explained. “It’s not for everybody. Those are choices and decisions we all make. My deal is to understand. You trust me; I trust you. It’s a two-way street. Developing that, it happens over time. It’s hard, yet I look forward to that. I look forward to being part of these guys’ lives. Having not yet evaluated the signal callers on Florida’s roster, McElwain felt it would not be fair to discuss the players and what he thinks about their ability. Rather, he believes he will get a good idea about each player while watching them interact with each other and practice during preparations leading up to the bowl game. In the end though, McElwain said he was unconcerned about who winds up playing behind center next season. “You got to understand this. I believe I can win with my dog Clarabelle. That’s the attitude. There’s good players here. That’s just our responsibility,” he said. Is she really that good? “You ought to see how quick she is. She can really go,” he said with a laugh. Back to being serious, McElwain did share his general concept for teaching and helping a player learn how to serve as a big-time quarterback at this level. “Eliminate the clutter. That’s the key. Eliminate the clutter and understand the important things,” he began. “First and foremost, the most important thing is affecting the people around you in a positive way. That’s first and foremost. Second thing is be one of those guys that’s going to out-study every person there is on what you need to do from a game plan standpoint, what you need to do from a characteristic standpoint, to stand apart. He had no choice but to ensure that nothing stood in his way of the Gators job – including a huge buyout he agreed to in order to get a raise at Colorado State a few months ago. Go Gators! Sign em up coach! No more frothing at the mouth, in the player’s face, displays of anger on the sidelines. I am expecting enthusiastic professionalism when they are excited from our coaching staff going forward. I hope coach Mac goes after those 4+ star recruits who de-committed over the past two months (especially the LB Urban turned from us). No reason to not have a top 5 recruiting class this year. We should expect a lot of positive 2014-15 recruiting results from this coaching hire. Worst Case, we will have a run-spread offense with Clarabelle leading it! Passing game, what passing game? Didn’t realize we had one of those. Georgia Tech and Georgia Southern have a better passing game than we do.